College enrollments have been falling the last few years, as I’ve said a few times. The loss of students is coming from the kids right out of high school, who leave wondering what to do next. The Flat Stanley Project basically has 2nd graders make a paper puppet, which they then send to a college student. The student then takes the puppet around campus, maybe takes a few pictures, and writes back to the small child about how great college is. The college student in this case is typically a freshman community college student, taking a puppet around campus for a grade in his “Freshman Orientation” class (orientation used to be an afternoon’s effort, but now our campuses are so large that a 14 week course is called for). Those six year olds would be better served if they heard from someone a few years out from college, trying to pay back his student loan debt while working a minimum wage job. The point is, the indoctrination into college starts very early, and is relentless. But the high school graduates are no longer listening, no more than sane people listen to CNN. –it’s interesting they use the word “skipping” here. There was a time, not that long ago, when college was just something a minority of our population did. Most folks didn’t “skip” college any more than they “skipped” taking a trip to China. Generation Z, people born 1990 or later, are ignoring the 12 years of indoctrination they received in public school, and at long last heading to trade school instead. Higher education is so expensive that now taking out a loan is primary way people can “afford” it. Trouble is, the only rational reason for taking out a loan is to get something which will help pay off the loan. Higher education used to be about education…but now it must be about money. But why is Gen Z realizing this, and not the kids heading onto campus, say, a decade ago? So, Gen Z sees not one, but two generations being destroyed by student loans for an education, an education which clearly won’t help to pay off the student loans. They’re starting to walk away. I feel the need to point out higher education has failed on two levels here. On the first level, it failed by lack of integrity. The sheer greed of our “leaders” in higher ed let them raise, and raise, and raise, tuition, sucking up all that loan money. I assure the gentle reader, it takes no more resources to train someone in English literature or mathematics today (just takes books and study) than it did 50 years ago…but tuition has skyrocketed. I grant some degrees are more expensive, for example electrical engineering takes a fairly expensive lab and materials to train a student, although the cost is the same for an EE degree as it is for literature or mathematics. If you want to learn how to hate white males (i.e., get a Gender Studies degree), the cost is still the same…but now you’re not even learning anything academic, and hurting your chances of even getting a job pouring coffee. Higher ed could have shown a tiny bit of imagination here and started to splice up tuition costs so that less intensive, less jobs-worthy, degrees didn’t cost the same as degrees far more precious in the workplace, but our leaders have no such imagination. 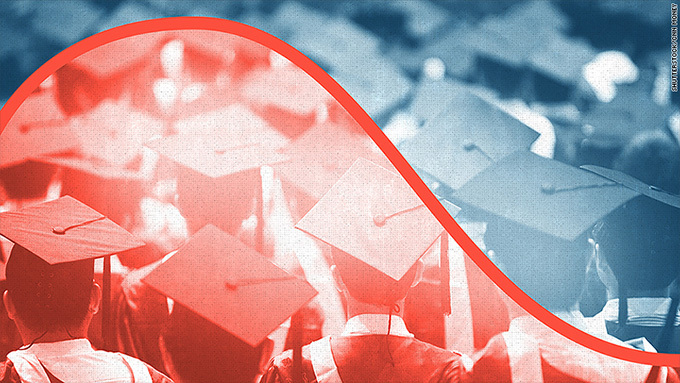 The other level where higher ed has failed? In training time. It takes 4 years to train a mathematician, or a historian, or an electrical engineer, because we have 4 year degrees. Now, our leaders in higher ed did realize that jobs training was becoming more important to kids coming out of high school, and responded by creating jobs-related degrees. Trouble is, those degrees also take 4 years. So we have 4 year hotel management degrees, even though you can learn everything you need to know about that, and many other jobs, in six months at best. Gen Z sees they can spend $100,000 and 4 (more realistically, 6) years getting an electrical engineering degree, and maybe make $60,000 a year after an unlikely graduation, or take a yearlong course on becoming an electrician, for 1/10th of the price, and make $80,000 a year. Seriously, higher ed didn’t just drop the ball here, it took a knife, slashed the ball, and tossed it into a sewer. I doubt that years from now, when people see our abandoned campuses and note the endless blocks of dilapidated palaces which formerly housed legions of administrators, it will be understood what happened by most, but I am trying to explain now, today. Our economy is so warped on so many levels now. Our medical care system is so demented that a doctor, after a dozen years of training to use the most sophisticated tools the modern world has, scarcely has a better job than a construction worker who needed a year at most to learn how to use his tools, many of which are little different than what they were a few thousand years ago. Now, I grant that, in a generation or three, the guy holding a shovel won’t be making as much as the doctor, but prior to generation Z, we had so many kids indoctrinated into college, missing their chance to learn a useful trade, that we’re now in this situation. Gen Z is wise to take advantage of our currently demented system, and I’m optimistic it’ll work out for them. Maybe they’ll even make enough to help pay off their grandparents’ and parents’ student loans.